27/3/10 – Art market – Paris – Several Parisian galleries have organized drawing exhibitions, as they do every year during the Salon du Dessin (see our article in French). This short review will not cover them all, focusing instead on three which struck us particularly for the quality of the works displayed. Alexis Bordes offers a group of sheets from a private collection. 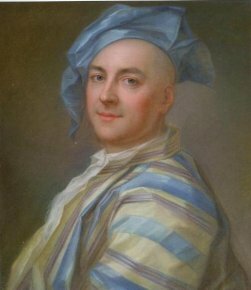 There is notably a rare Self-portrait (ill. 1) by a relatively unknown artist, Jean-Louis Lambert, a pastel so fine that it recalls those of Maurice Quentin de la Tour, as well as a humorous drawing on vellum by Nicolas Robert representing Warthog against a Backdrop of Greenery. Some paintings are also presented, including a beautiful grisaille study by Jean-Baptiste Deshays. On the Rive Gauche, the hang at the Artesepia Gallery directed by Georges and Angelique Franck is also of interest. The selection of drawings currently on display is of very high quality. We would mention for example a superb Martyrdom of Saint Hippolyte, a work by Simon Julien perhaps. Unfortunately, there is not a catalogue. We return finally to the other side of the Seine, at Nicolas Schwed’s, rue Saint-Honore. Number one in the catalogue is a fine discovery, unpublished to date, of a standing male figure (no doubt an apostle), by the Roman sculptor from Lorraine Nicolas Cordier. A large sheet by Carle Van Loo, a preparation for The Presentation at the Temple from the church of Saint-Sulpice in Paris is also worthy of mention. Galerie Artesepia, 40, rue de Verneuil, 75007 Paris. Tél : +33 (0)142 96 29 21. Nicolas Schwed, 346, rue Saint-Honoré, 75001 Paris, jusqu’au 27 mars, 14 h à 18 h 30. Tél : +33 (0)6 82 83 96 51. Catalogue.